How to define oil level with custom pan/dipstick? › How to define oil level with custom pan/dipstick? While my 429 engine is still open, I'd like to verify or redefine the ideal oil level for it. I have an oil pan that looks to be original for the 2/3 top part, but has been modified, looks like a mix of a perf after market one with the original. Its deeper by +- 2 inches and got an oil splash screen added so all stays at pickup level. I also have a dipstick, looks like an original that has been chromed. For same price its some repop, I don't know. I have no idea how much oil must go into it, but from the look of the added metal, I'd say at least 1.5 to 2 quart extra will go in there. I'd like to know and not guess. Now that I have full access, I'd like to define/check the low and full on the stick before I close the engine. The mouth of the pickup when emerged is 22cm from engine oil pan surface. So in that regard, I know the low is slightly higher than this. But how to define the upper level? Up to where is the oil supposed to be when pan is said "full"? First, your pan to pickup clearance should be right about 3/8" or 10mm ---- 22mm is way too much. Canton makes a 10" deep sump for the 429/460 and it's rated at 8 quarts with the filter. Normal procedure for setting the oil level on the dipstick is to fill the pan to rated capacity, start the engine to fill the system. Shut it off and let it drain back for a minute or so. Pull dipstick, wipe, cycle the stick again, and mark the stick where the oil is with a file. FWIW, the deep pans are not popular anymore for a good reason, they have ground clearance issues. You might be better served with a "T" style pan that won't be the lowest part of the car. (08-22-2018, 08:04 AM)Hemikiller Wrote: First, your pan to pickup clearance should be right about 3/8" or 10mm ---- 22mm is way too much. I think there is a confusion here. Would be impossible. I'm after the green line (oil level when full). Yes when the capacity is known, thats one of the missing params. If your dip stick and dip stick tube is correct length the pan has no bearing on fill level. I cannot give you that I do not have a 429 car. You fill until it is at the correct height on the stick. Yes you need to start and get it all filled and then check and bring to correct level. Lots of oil not needed on a street engine. If racing a dry sump is better keeps the oil away from the crank that makes it foam. Should have a windage tray to help with crank slapping oil also. A deeper pan without longer pickup really does not add anything that helps your engine. A really high volume oil pump can sometimes fill up the heads / valve covers with oil. That is why you see the tall tubes on some of the racing engines to keep from throwing out oil all over the engine. Clear the oil drain back holes on the ends of the head to make that better. 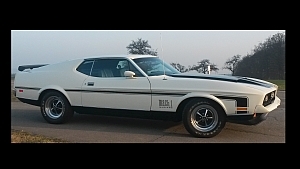 If you are not racing go back like original it worked. (08-22-2018, 09:14 AM)Carolina_Mountain_Mustangs Wrote: If your dip stick and dip stick tube is correct length the pan has no bearing on fill level. I cannot give you that I do not have a 429 car. You fill until it is at the correct height on the stick. Yes you need to start and get it all filled and then check and bring to correct level. Lots of oil not needed on a street engine. If racing a dry sump is better keeps the oil away from the crank that makes it foam. Should have a windage tray to help with crank slapping oil also. because I don't know if its the right one, its one of the params that I want to define/verify. The pump is an high volume and the pickup is bits deeper than the original one. Fits nicely. They is one in it. As said its the original one and its been modified. A nice alternative like a Milodon would be nice for sure, but at more than 1k euros once here to replace a pan that is fine is bit silly. My mistake on the first post - I'm not used to using cm as a unit of measurement. I immediately went to mm. My post is about clearance from the pickup to the bottom of the sump. Stock 429/460 front sump pan was about 8 1/2" deep. How deep is your current pan? What are the dimensions of the sump that was added on - side to side and front to back? I can calculate the volume from that. Do you have a pic? It might help me identify who made the pan. Like Hemi said, best procedure is to use the correct dipstick and tube, put 6 quarts of oil in it, start and idle engine a few minutes, let set long enough for oil to drain into pan, add oil until it's on the full line on the dipstick, the total quantity you put in is your capacity. I don't ever remember seeing a specification for the height of the oil level. I'm sure Ford engineers knew it, but they didn't share it with the rest of us. If you have the correct dipstick and tube, and before installing the pan, insert the dipstick into the tube and measure the distance from the full line on the dipstick to the bottom of the block. That will give you the distance to measure down on the oil pan. whether your new custom made oil pan is deeper or wider than the original one, it does not have any impact to the full or add level of your dip stick. You just have to fill in more oil. (08-22-2018, 11:45 AM)Hemikiller Wrote: My mistake on the first post - I'm not used to using cm as a unit of measurement. I immediately went to mm. Some pict of it during its restoration here. 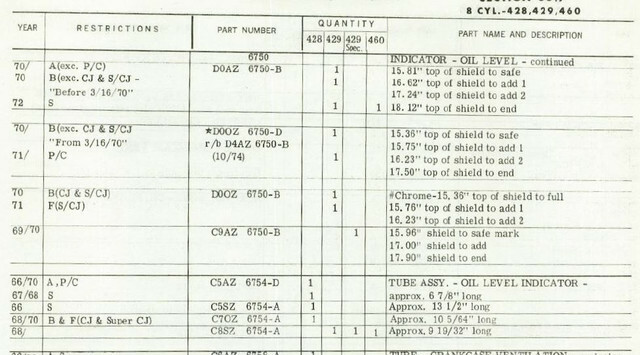 This info is crucial to make oil pans, so there must be a manufacturer that knows it... and as its not some sensitive info, I just need find someone that actually know what the numbers are. Of course If someone would have an original dipstick, and could give me the distance from it on the tube, and give me the distance to the mark "full", I could also define where the level should aproximatly be, and compare mine to see if its fairly same or totally off. As the pan is now out, I could once I know, fill it to that line and know how much oil goes into it. Fabrice - here's the dipstick and tube info from the MPC. The pan you have looks to simply be a modified 429CJ pan. This was a pretty common modification back in the early days. Slice the bottom off and add a band of metal to increase the depth of the pan. There were very few oil pan companies back then, so much of it was home brew. Even then, the oil pan companies were producing stuff like this anyway. 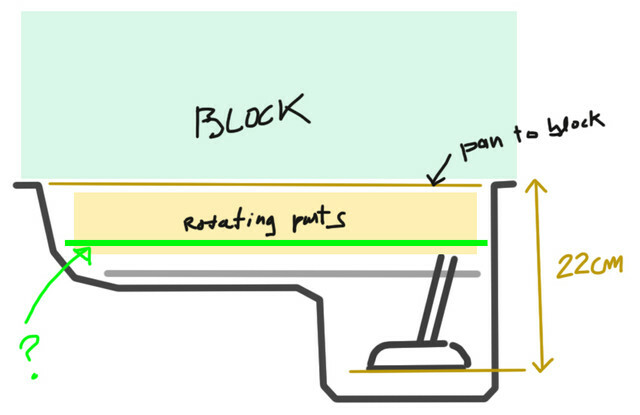 The reason to increase the depth of the pan was *not* to increase the capacity, but to get the oil further away from the rotating assembly to reduce windage losses, and the vertical "wall" in the back helped keep oil in the sump during hard acceleration, versus the slope of the stock pan. As far as oil capacity, use the factory fill, which depends upon whether or not yours has an oil cooler. If you want to use the extra volume in the pan for more oil capacity, measure the sump length x width x height. There are 58 cubic inches per quart. Add that amount to the factory fill and you should be spot on.